Join Royal Clipper for this tour of the Caribbean islands, with a transit of the Panama Canal and visits to historic Colombian cities. Enjoy a thrilling transit of the Panama Canal before sailing to the remote San Blas Islands. Visit the magnificent UNESCO World Heritage Site of Cartagena and see the remains of the Tairona culture in picturesque Santa Marta, Colombia's oldest surviving city. In the stunning ABC Islands stroll along the palm-lined streets of Oranjestad, Aruba's capital, admire the magnificent colonial Dutch architecture in Willemstad and explore the picturesque island of Bonaire. Discover the spice island of Grenada, admire the dramatic peaks of the Piton on St Lucia and visit the unspoilt harbour of Des Haies on Guadeloupe. Embark Royal Clipper in Balboa. Strung along Panama's dramatically beautiful Kuna Yala coast, the remoteness of these coral atolls protects an independent people who prize their communal culture with its artistic heritage. The reefs around the archipelago offer fantastic diving and snorkelling opportunities. Remains of the Tairona culture can be seen in picturesque Santa Marta, Colombia's oldest surviving city. The aromas of nutmeg, cinnamon and vanilla baking in the sun - these are the tropical flavors of Grenada. From the horseshoe-shaped Carenage at St. George's the Sendall Tunnel (hand-built in 1895) leads to the Esplanade and old Ft. George for a spectacular view of Grenada. Carenage is the old harbour area, where you can see a casting of the famous 'Christ of the deep' statue and watch wooden schooners unloading their cargo. For an idyllic beach, head for Grand Anse. 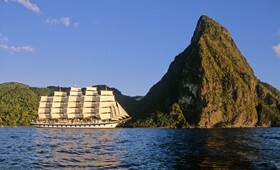 St Lucia is well-known for the Piton twin-peaks, its rainforest and the indigenous St Lucia parrot. The verdant landscape gives way to banana, coconut and mango plantations. Soufriere has sulphur springs created by the nearby volcano, and beautiful Anse Chastanet beach. The picture-postcard fishing village of Deshaies is home to the magnificent beach of Grande Anse and superb botanical garden. Disembark Royal Clipper in St John's.